Halloween is just around the corner. Let’s start preparing for ‘Trick or Treat’. We don’t need to burn a hole in our pocket this festive season. Just DIY what we can. 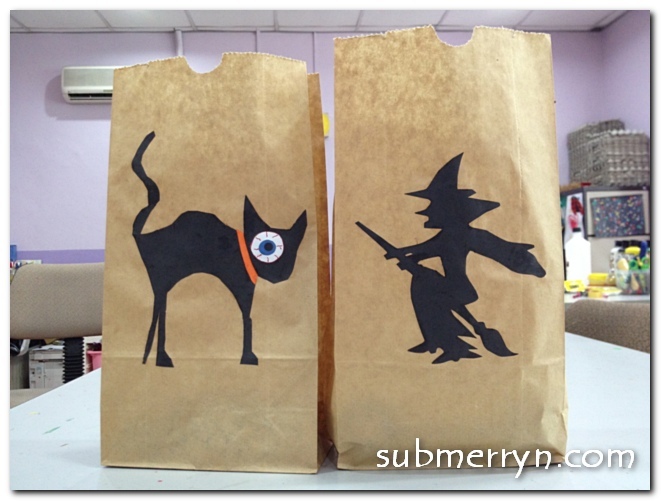 For this Halloween Goodie Bag, all we need is brown paper bag and black sugar paper. First, draw any creepy Halloween features on the black sugar paper. Let your child cut it out. You may need to assist him/her if they are not ready to handle the scissors yet. Apply glue to one side of the sugar paper. Paste onto the brown bag. Decorate as you wish. The Halloween Goodie bag is ready. You may also use brown bags with handles.